Gatsby Spas was founded in the 80's. Gatsby Spas are no longer in production, but Hot Tub Outpost still has select Gatsby replacement parts or alternative spa replacement parts that will keep your spa running. Blue Ridge spas which branched from Gatsby was offered at Lowes and Jacuzzi purchased the company in June, 1999. Other lines manufactured included Blue Ridge spas, Swift River,and Imperial Spas. We also carry a wide range of accessories and chemicals that go with any brand of spa. We ship orders over $95 free - anywhere in the continental USA. Gatsby spas had 24 hour circulation pumps for water filtration. We carry a variety of heaters for Gatsby spas including the popular C2550-0066-ETA 240V 5.5kW heater. The C2550-0267ET is also a 5.5kW heater (2 inches x 15 inches long). The low flow heater is E2550-0202ET (5.5kw - low flow for circ pumps). The main horizontal canister heaters were either 4kW or 5.5kW. There were also vertical heaters that were connected to pressure switch. Tecmark pressure switches were used in many of these spas. When replacing a pressure switch, use teflon tape on the threads for a good seal (unless the new replacement pressure switch already has red pipe dope on the threads). Connections on the switch are non polarity so wires can connect either way. There were also flow switches installed in the plumbing that serve the same purpose depending on the model. Unlike pressure switches sometimes attached directly to the heater, the flow switches attach to the plumbing and are directional, so the new switch must follow same flow as old one. Gatsby spas used either the High limit (OH) sensor attached by a clip to the bottom of the heater or it would use a disc high limit sensor against the heater. The Temperature sensor is usually located in a thermowell and attaches to the circuit board. You will mainly find the "dry well" type sensor in Gatsby spas, but there are some that use the "wet well". In the dry well, the sensor is inside a plastic assembly housing attached to the spa shell, but the sensor bulb never directly touches water. These spas used either a 1042 or 1044 type circuit board in the spa pack. We offer replacement for the 6600-287 board. Control panels had either 1 jet button or 2. Jacuzzi only currently supplies the 2 jet button version. See our Ultra 9000 115V blower replacement with AMP cord. Most of the blower used at either 110V or 220V were 1HP blowers. You must match voltage when replacing blower! There are UV and Corona Discharge type ozonators. Gatsby used mainly the UV bulb. You can switch to CD if you like. You must confirm the voltage of the spa because 120v spas will need a 110-120v ozonator. 230v spas could have either 115v or 230v ozonators so check the label on the old ozonator for the correct voltage. Some new ozonators are voltage sensing such as some of the new Del Eclipse ozonators which we offer. See our APG ozonator for a great fit. This one comes with AMP cord (white 4 pin of which 3 wires are connected). If your spa uses the J&J molded connector, then see our 6473-150. Popular filters include threaded bottom type and ones with open ends that use a filter basket. See our full range of Filbur filters for the right cartridge. You can search by model stamped on the end cap of the filter, or by dimensions. 50 sqft filter PRB50-IN is one of the most popular 50 sq.ft. filters with 13.3 inch length and open top and bottom. Other filters include the XLS-607(50sqft - 9 inches long), PDM25P4 - 8 inches long (25 sqft) and PJW23 (25sqft) at 10.37 inches long. The PTL47W-P4 was also used (50sqft - 9 inches long) - see Filbur FC-0315 - this one has 1 1/2 inch threads on the bottom. PDM25P4 is 8 inches long and has 1 1/2 inch threads on bottom too. 24 hour circ pumps (115v or the more common 230v) are used in Gatsby Spas. Plumbing to the circ pump is usually 1 inch plumbing. Some spas used a 2-speed pump as both the main pump and circulation pump. The main pumps can be either 1-speed or 2-speed pumps operating at either 115V or 230V. Most of these pumps have a side discharge, although some of the 115V pumps had a center discharge (top center). This affects the way you hook the pump up to your existing plumbing. Suction and Discharge of the pumps were either 1 1/2 inch or 2 inch. The lines that run to the manifolds is 3/4 inch water plumbing hose. These hoses were clamped to barb fittings. On the motor side of the pump you will mainly find either Emerson or AO Smith motors (115V or 230v). One of the 2 1/2 HP pumps 240V 2-Speed NB1 is the Sundance 6500-343. The original Gatsby spas in the 1990s including the Classic Octagon Spa which had a 1/25HP circ pump and a 1.5HP Ultra power jet pump had a 6kw heater at 230v (or 1.5kw at 120v). These spas used the "glueless plumbing" system with clips. The Classic Family Spa had a 1HP blower and used 2x 25 sqft filters. These spas were delivered ozone ready with optional ozonator. Pumps included a two-speed 1HP pump installed in the Model 31 3-person spa. This particular unit was convertible to operate at either 120v/16a or 240V/40amps. The larger model 72 used a 2HP pump (2x 1-speed pumps and a circ pump). Frame size on Gatsby pumps is mostly 48 Frame. Check the label on the pump to get all the info you need for a replacement pump here at Hot Tub Outpost. We offer the Jacuzzi "E" circ pump and the replacement for the red Laings. 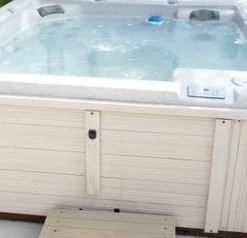 See our Jacuzzi and Sundance parts to find many of the plumbing and other parts used in Gatsby Spas. We have a wide variety of replacement jets as used in Gatsby spas. Need help identifying them? Send us pictures and diameter measurements. Popular jets included the 2 inch Euro Swirl Jet (2 inches diameter and 2 1/2 inches long). There were also the directional 2 inch jets, the 3 1/2 inch cyclone luxury jets (directional) and the 4 inch cyclone swirl jet. Luxury swirl or directional jets (3 1/2 inch) were also used. (gray). Smaller 3 inch Micro jets (directional or swirl) in gray with scalloped design were also used. Gatsby manufactured many different models of portable spas . They had the rectangular, 3 person Gatsby Model 31. The square model 45 with lounger, the larger model 61 with lounger and tapered corners, Model 62 with a lounger and curve bench; model 65 with a dual lounger and 3 seats, and model 72 with a lounger and 2 captain seats in an 81.5" x 92" shell. The Winchester -Kensington model is a lounger spa. Contact us at support@HotTubOutpost.com if you need assistance in finding the right spa part or accessory for your Gatsby Spa hot tub - send details/part number/even a picture along with your request if you like. We know you'll want to get back to enjoying your Gatsby Spa hot tub, so we'll get back to you quickly. Hot Tub Outpost is an authorized independent spa parts dealer and is not owned by or affiliated with Gatsby or Jacuzzi.